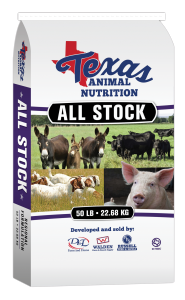 For beef cattle, mature horses & goats. Processed Grain Products, Roughage Products (26%), Grain Products, Plant protein products, Molasses Products, Calcium Carbonate, Salt, Zinc sulfate, Copper sulfate, Vitamin A Supplement, D-activated animal sterol (source of Vitamin D3 Activity), Manganese Sulfate, Vitamin E Supplement, Ethylenediamine Dihydriodide, Cobalt carbonate, and Sodium selenite. Beef Cattle & Goats – Feed as a complete feed to beef cattle and goats in dry lot or on pasture. Horses – Feed at the rate of 0.5 to 1% of body weight with access to pasture or hay. Feeding rate should be adjusted based on body condition and activity level of the horse. For beef cattle, mature horses & mules. Processed Grain By Products, Roughage Products (30%), Molasses Products, Salt, Calcium Carbonate, Zinc Sulfate, Copper Sulfate, Manganese Sulfate, Vitamin A Supplement, Vitamin E Supplement, (Preserved with butylated hydroxyanisole), D-Activated Animal Sterol (Source of Vitamin D3), Cobalt Carbonate, Ethylenediamine Dihydroiodide, and Sodium Selenite. Feed to horses, mules and cattle at the rate of 0.5 to 1.5% of body weight per day. Always provide access to an adequate supply of roughage and fresh clean water. For cattle on pasture or feedlot, adult horses & mules. roughage and fresh clean water. For cattle on pasture, adult horses & mules. Ground Limestone, Manganese Sulfate, Zinc Sulfate, Copper Sulfate, Ethylenediamine Dihydroiodide, Vitamin A Processed Grain By-Products, Roughage Products (21%), Plant Protein Products, Molasses Products, Salt, Supplement, Vitamin E Supplement (preserved with butylated hydroxyanisole), Vitamin D3 Supplement, Sodium Selenite, Cobalt Carbonate. Feed to all classes of cattle at the rate of 2 to 10 pounds per day or free-choice with adequate pasture of hay. Feed to horses and mules at the rate of 0.5 to 1.5% of body weight with adequate roughage. Always provide adequate fresh, clean water.